I have reached my 25th follower here on WordPress!! Because of this milestone, I am very excited to be offering TWO free copies of my book! Have you ever wondered about speaking in tongues? Questioned whether or not God really is able to heal? Have you ever received a word of prophecy, but didn’t know what to it was for? Do you want to know how you can hear God speaking to you? Presented in a fun, simple and conversationally based question and answer format, here is a small book that shares examples of prophecy, healing and tongues in the Bible, and explains how you can also learn to use the gifts God gives you. 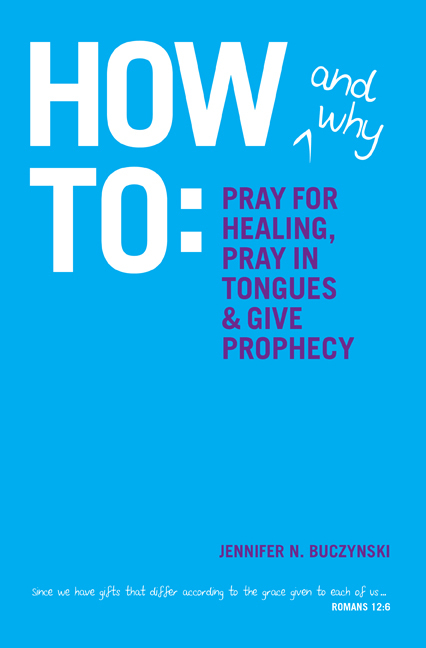 “How & Why to: Pray for Healing, Pray in Tongues & Give Prophecy” is filled with the biblical answers that you, too, have been searching for! One person will receive a PDF file and the other will receive a free hard copy book. The winners will be chosen at random. Please like this post or send me an email at jennifer.n.buczynski@gmail.com to be entered into the drawing! Winners will be chosen & announced Monday morning! Books are also available for ordering ($10 plus shipping) at www.growinginjesus.com/spiritual-gifts-book. By JenIn UncategorizedTagged Christianity, free book, giveaway, hearing God's voice, Jesus, praying for healing, Prophecy, speaking in tongues6 Comments on FREE BOOK! SPECIAL ANNOUNCEMENT! I tried emailing you twice, but I received a fail notification in both instances. The contact page on my blog will send it to my email. That’s strange, because I got your email! I will be sending it when I get home this evening. That is really weird! But I’m happy to hear that you did! That makes life easier!